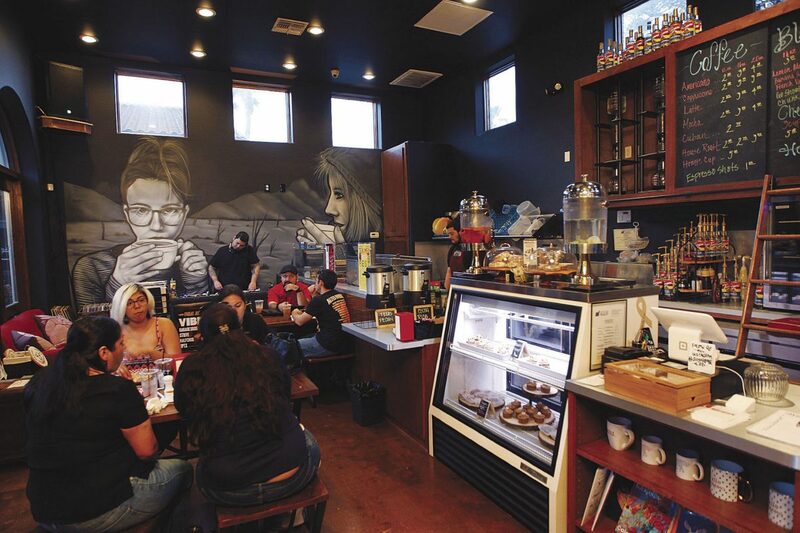 Tucked away inside the Art Village on Main in downtown McAllen is a tiny coffee bistro aimed at promoting social interaction and artistic cultivation. Appropriately named to fit its size, The Sugar Cube offers a fresh concept to the standard coffee house featuring slow drip cold brew coffees, a vegan menu and spoken word nights. Made from scratch vegan pastries fill the display case near the counter of The Sugar Cube where guests can choose from a wide variety of food, cold brew coffees and teas. The food menu is divided into vegan and non-vegan sides, but Greagrey plans to make the menu entirely vegan by mid-August. “We wanted to offer an all-vegan menu because there are hardly any options here for vegans when you want to just go out and eat,” he said. One of the best sellers is the vegan double cheeseburger which is composed of two vegan patties, two slices of vegan cheese, roasted red peppers, guacamole, vegan mayo, mustard, and grilled mushrooms and zucchini. For $12, the burger comes with a side of chips with homemade salsa, pasta salad and a drink. All the pastries at the bistro are made in-house by Greagrey’s wife, Ruby Avila. The most popular items from the baked goods shelf are the confetti cookie cakes and the Chunky Chango cupcake. Apart from the bistro side, The Sugar Cube doubles as an artist space with a turntable lounge, live DJ sets and spoken word nights. Spoken word nights happen every Thursday from 8 to 11 p.m. featuring local novice and professional poets for an open mic opportunity to showcase their skills. Greagrey wanted the space to encompass this kind of artistic network because he spent years performing as an acapella battle rap poet himself. Being an open mic event, the opportunity to perform spoken word poetry is extended to anyone who wants to participate. Attendance has been moderate for now, but Greagrey hopes that the audience for spoken word will become larger as the event grows popularity. That same open mic concept extends into Fridays which are dedicated to freestyle DJ sets and Saturdays for acoustic performances. Greagrey said although the space inside the shop is small, he hopes it will inspire guests to interact and start conversations with people outside the typical bar scene. The Sugar Cube is open from 7 a.m. to 9 p.m. Monday through Wednesday, 7 a.m. to 11 p.m. Thursday and Friday, and 9 a.m. to 11 p.m. on Saturdays. The shop is closed on Sundays. For more information, visit their location at 800 N. Main Street, Suite 500 in McAllen or find them on social media.